Can you tell us your Paul Boutin/Wired story? > control of my feed urls. I never understood how easily people are giving up this part. BoingBoing entrusts Feedburner the serving of tens of thousands of their readers (or whatever their number). If Feedburner is down, changes their terms, adds ads of their own, asks for lots of money etc. there’s not a whole lot you can do except telll your readers to manually change their subscriptions. Description: Allows users to redirect each category feed to his own FeedBurner feed. Unlike other plugins that redirect all the feeds to the main feed, this plugin allow you to have a feedburner feed for each category or subcategory. Congrats for those great stats Matt !!! LOL (For Years, only SearchEnginesWeb was doing this. The top entrances reflect those topics that were universally vital and informative to SEOs and Webmasters, that they bookmarked, linked to and reviewed again and again. More detailed information would be appreciated, for example how much traffic does the term SEO bring from Google and Yahoo – daily and monthly. This is the blog’s most popular term and the one that it now ranks on page one on Google and Yahoo. What is unfortunate is the lack of visitors from the South American continent – perhaps, and alternate SPANISH version of the blog could be released and promoted on a Seperate directory eg: mattcutts.com/espanol. Sergey, I added geo-location data to the post; thanks for mentioning it. Chris Winfield, thanks very much for the pointer. I hadn’t even begun looking, and that should help. Tobias, I did know that I had a lot of European visitors. I have to do some hard thinking about translations; normally I’ve shied away from translations to other languages, in case something is wrong in the translation. I have to think about that; maybe I should be doing more posts on the official webmaster blog and then asking someone at Google to help me with translations? S.E.W., I haven’t checked, but the vast majority of my traffic is for my name. I only got 6,319 visitors for the term [seo]. Matt: I’m pretty sure that the FeedBurner redirect plugin only works for the main feeds. I think You’d have to manually burn feeds for all the separate categories and then modify the plugin to handle the redirect. Now that you’re using FeedBurner, you can help yourself and the rest of us get better statistics by getting the Google Reader folks to report the number of subscribers in the user agent the way that bloglines does, so that FeedBurner can give us an accurate count. Yay. That’s quite a bunch of Europeans. But again most of your visitors seem tech-savy enough to understand your English texts (I do, I’m German). Aren’t there plans for Google webmaster stuff in Europe? Maybe some official texts of yours on Webmaster Central could get the translation. Sounds like a good idea to me. Scott Carpenter, I mentioned that to the Reader folks before I even tried Feedburner. 🙂 I know that they’ve got a lot to work on, so I don’t know when/if they’ll be able to do that though. rob, my theory is that SEOs and techies skew heavily toward using Google. I did mention the referral numbers from other engines, but haven’t computed the percentage. Mika, I agree that would be a good idea. ah, thats what I get for looking at pretty pictures and reading with tired eyes! I understand your concerns about translations. But if we make clear that it is only a translation and not allways reflecting your opinion word by word (but we try to ! ), I think it would be a great deal for german speaking webmasters. And there are many who do not speak the English language. It’s interesting how the big spikes occur when Webmasters are feeling the most pain. After spending the past few days reviewing complaints from Webmasters in many forums, I am convinced more than ever that something more than a “data refresh” is up — even if whatever significant changes Google made were implemented months ago and it took only this long for the effects to be felt. I am from Germany, too. I don’t think thats a good idea to translate it. Most People who are interested in SEO and Google and stuff speak english. Eine Menge Arbeit und Aufwand, die sich wahrscheinlich nicht lohnt. Sorry Tobias, is nur meine Meinung. I never knew about Google Analytics. I will be having a play with it today. Do you know whether Google Analytics tracks the page views for your site (as an example) even if I am reading the material through an RSS reader? Most of the time I read your entire blog in my RSS reader as you are providing all the post content in the RSS feeds. I am a regular reader, so I am just wondering whether this is accounted for by Google Analytics? Cheers and Happy New Year 2007. Great blog by the way. Matt I noticed a time ago that searching for information on “reinclusion request” brings your page about the subject from sept 8, 2005. It has good information for people, but I think the link you have in the post needs updating. I believe that the reinclusions are not handled through the webmaster tools or something, perhaps an update to that post would be prudent since you are the first search result. Also I think the choice to avoid adwords is a good one, it does add a sense of credibility in my eyes, and makes (some?) people more likely to link to the info presented here. It also avoids things seeming like conflcts of interest. I thought it was quite funny to hear all the audio ads for “text link ads.com” when listening to your interview on webmaster radio a time ago. It seemed like an endorsement for an ad company in some ways. Your blog is only plain and spartan since you pulled the spam button / spam sword pic during the digg spike. Perhaps a “most popular posts” on the sidebar, or links to the various niche rss feeds would spruce it up a bit and add more to the blog rather than detract from it..
Jason, I don’t think it does. Fundamentally, web-based feedreaders seem to cache the RSS and then show it to all their subscribers. So I think even if you generated a unique image for each RSS fetch, the Reader (or Bloglines) fetcher would grab that unique image and cache it; there may not be any way to track subscribers in RSS accurately right now. I basically pulled this whole paragraph out of thin air though. I don’t know if this is actually how it works; anyone else know more? Steve, yup, reinclusion requests should be done through the webmaster console now. That’s one of the first intro-level pieces of info that I need to refresh. Perhaps those refreshes of your intro- level pieces could be turned into official guidance on one of the blogs? wow impressive!, nice traffic Matt!! 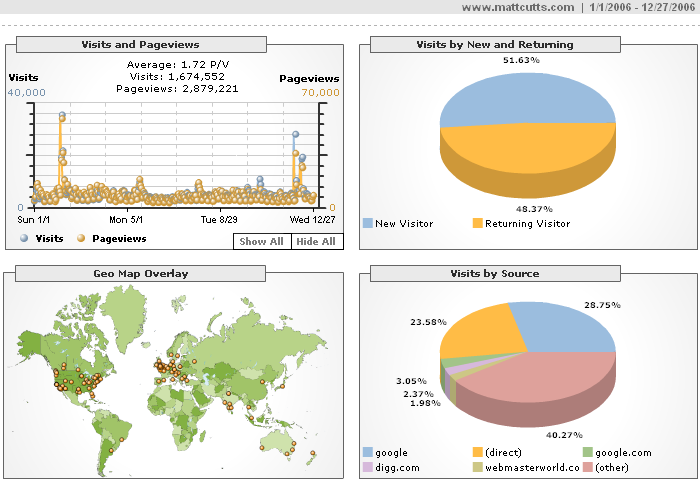 I think the owner of mattcutt.com has a huge traffic too. Google Reader not giving stats is an exception. GR not providing it has been a fairly major concern for a lot of publishers, but I always thought it might be a design decision, giving additional privacy, in much the same way that Gmail doesn’t display images thus doesn’t give open rates by default. Analytics will be great when they offer comprehensive Adsense tracking, enough to defend yourself if there is a click-fraud problem, and maybe combining with some split testing. I’m surprised that South Africa did not feature in your country stats. I thought we were a far more “Google” aware crowd. Do you have a number for SA or did it not feature at all? Matt thanks, this is really interesting. I’m trying to figure out why Jeremy Z gets a much higher percentage of his traffic from Google than you do. I’m guessing it’s related to his much higher number of total posts but not sure why that would have this effect on traffic. – changes of the quality of Google’s serps. Good or bad. So… are you telling us that from now on we are going to see all above mentioned “changes” on daily basis? As I see on the Geo Map, you have not even a single visit from Africa for the whole year?? Not even by accident? I guess there is no need for seo, no spam or what? Anyway, congrats for the very interesting post and a Happy New Year! What the figures really indicate to me is how seriously the UK – and Europe as a general market – needs to be taken by search engines as an audience. I mean, when was the last time a “name” from Google appeared at SES London, let alone put on a party? Google sends PPC account managers – great! – but compare that to the attendance at US SES shows. But I do have one question (off topic though ) on the Title of the blog ! Andy: I can’t see that there should be a privacy issue if in the Google FeedFetcher user agent it reports the number of subscribers — that tells you nothing about how those subscribers are. Matt, I wasn’t questioning your statement that there would now be continuous data refreshes. I’m simply pointing out that there are other changes Google has implemented in the past few months — perhaps in the August – October period you outlined for us this Summer — that have clearly, obviously, and oh-so-blatantly caused many thousands of link-poor Web sites to go Supplemental and in some cases to vanish completely. You don’t have to admit to, dispute, or in any way address, confirm, or deny anything. The changes in behavior at Google are clearly, widely, and completely well documented in numerous online forums and blogs. We’re way past the “It’s just a data refresh” stage. Whatever it is, I am not personally holding you responsible for its effect. I was just pointing out how interesting it is that your traffic spikes every time Google makes a huge, horrendous change — even if you personally don’t see that anything huge happened, or if you personally are not at liberty to discuss anything other than “data refresh” activity. I have no doubt that more frequent, continuous data refreshes should result in more frequent, continuous search results changes. But that is not what people are reporting. So, not to put too fine a point on it, there is a huge disconnect between what you are confirming and what people are complaining about. Which really has nothing to do with the fact that I feel you have become the visual figurehead for Google by virtual of your direct accessibility. This blog made you far more accessible than anyone else at Google. Because of that accessibility, you are — for all intents and purposes — perceived as the “voice of Google” — despite your disclaimer. Bogdan: For the Geo map, in that view GA just shows you 100 data points. The most you can see is 500 at a time. Excellent results Matt. Best of luck in the new year. some months ago I had a look at one of “my” server statistics and found out that around 10 percent of the people coming from search engines (most of them from Google) are lost people if do not find a way to make your feeds work for you. I also heard about the feedburner solution but I didn`t like the idea of outsourcing my feeds. 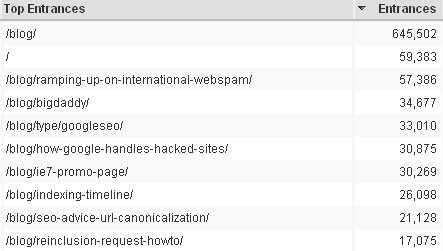 I checked the feedburner results for somebody else and saw lots of 302 redirects. This has defenitly not been the solution I was looking for. However. If you like to have a copy of my solution and work with your own server stats after that I could try to explain it (English and German). All you need is a little XSL file some CSS and a bit of code in your wp-rss2.php as well as in your wp-commentsrss2.php to swap older browsers to your XSL feed like I did. For me this is the best way to work with feeds. So I´ll explain it anyway. If you like you can grab a copy from my blog in a view days. Hopefully it`s online tomorrow already (it`s 11.45 p.m. here right now). But I`m sure you should find a similar XSL solution for WordPress with Google otherwise, if you like idea of giving your feed some usability instead of outsourcing it. feedthebot, we are looking for ways that I can just brain dump and someone can assist in writing that up in some more official way. If it starts to happen, it would be on the webmaster help pages or on the webmaster blog. Andy Beard, the next time I see a Reader person I’ll try to remember to ask more. Caraie, I talked about that a little bit toward the bottom of the post. Michael Martinez, I can try to talk more about things like supplemental more. Usually it’s not because I’m trying to sidestep, but because I’ve said the high-order bits already. For example, the main thing that determines presence in the supplemental index is PageRank. Not enough links for a page to make it into the regular web index? Then it’s likely to be an issue of not enough PageRank to that page. The page used to do well and now it’s in the supplemental results? It could be that links that previously counted aren’t as trusted anymore. For example, if someone’s doing a co-op link exchange, or buying links, or reciprocal linking to excess, that’s the sort of thing where those links might not be counting as much as they used to. Thank you, Matt. I think that will help people put things into perspective far more readily than anything I may have said over the past few weeks. Thanks for sharing all the great information, and great job on all the attention you’ve been receiving through your blog. Thanks Matt I appreciate your response and what you are doing with this blog. These stats, and the blog in general, are very interesting. I’m surprised that I don’t see Israel on the map. Contrary to being a very techie country, I guess we are still weak in the SEO field. A 7th place is not very bad for a small country like The Netherlands! I have unintentionally skewed a bit your stats. Every time I visit your site I do it by typing “Matt Cutts” in Google. I did not bother to bookmark your page neither I type URL in my browser. I wonder how many of us cutlets are doing it and if I assume there more examples like this one how reliable is any statistical tool? they think they could doe it with humor and less danger. and have I to live with it further? but please write, who knows that and maybe thats a cause to give away the Stats-process to an outsider? Interesting stats Matt! I usually find you by using just “matt cutts” but that does not reflect there in top keywords phrase. interesting to compare some other stats. For example, the CIA Worldbook offers population stats. US – 300M, UK, 60M. So if the US gets 750k visits, you’d expect about 150k visits from the UK to keep in the same proportion to population. 210k visits is around 35% higher than you’d expect. If you then add stats on penetration of ADSL (an indication of how much internet usage/access there is) then the UK stat is more surprising (US has a higher ADSL penetration than UK, according to the last IAB stats that I saw – by more than 20%). Eric Schmidt, quoted in The Economist says that the UK has a higher proportion of online advertising spend than the US (17% of all advertising in the UK, almost three times the US rate, IIRC), because of non-commercial BBC TV watching. The UK is highly interested in search marketing, disproportionately so. And we do get relatively little attention from Google. Some of the betas are, probably unintentionally, discriminating against UK based organisations – the Web Page Optimizer beta only accepts a US phone number, for example. I see only 8 subscribers in bloglines (which is clearly incorrect), because I recently subscribed to your SEO/Google specific feed. So that may partly explain the discrepancy between different versions of your stats. I have an added question, why do you have all those ‘how to’ things listed as SEO/google? Leuke website, Doe je aan links uitwisselen? Nice website, do you exchange links? It sounds like you were only aware of the main feed, and were only looking at the sub counts for the top feed, and not adding them all together. It does look like you are attempting to redirect these different feeds to FeedBurner at the HTTP level. Normally when multiple feeds redirect to the same URL, we automatically combine them. However, The reason they are not being combined, is that you are using an HTTP Temporary Redirect, rather than a Permanent Redirect. The other alternative is to use the Bloglines Publisher Tools ( http://www.bloglines.com/profile?mode=4 ), where you could combine the feeds in a few minutes. Wouldn’t spikes be related to page rank updates? They are fantastic stats for a great blog. Downunder in Aus (Australia for those who dont know!) there are a stack of people I know who follow your blog, not just at the Advertising agency I work for, but local forums & industry guys aswell. Hope to see you down here some day. I’ll buy you a beer! It would be interesting to see angry reactions if you implement (even a faked) adsense ads on your blog. Fundamentally, web-based feedreaders seem to cache the RSS and then show it to all their subscribers. So I think even if you generated a unique image for each RSS fetch, the Reader (or Bloglines) fetcher would grab that unique image and cache it; there may not be any way to track subscribers in RSS accurately right now. I basically pulled this whole paragraph out of thin air though. I don’t know if this is actually how it works; anyone else know more? What would be useful, is if GA allowed some way of routing RSS feeds through their servers. It’s probably not feasible because of bandwidth implications. Still, if they could figure out some way of only routing the HTTP header through the GA server, that would work. You should get a cat next time and name it Leontief. I use google analytics since 2 months and have to say it’s an excellent tool, easy to use and lots of info, splendid! I use Google TOOLS since 1 One Year. 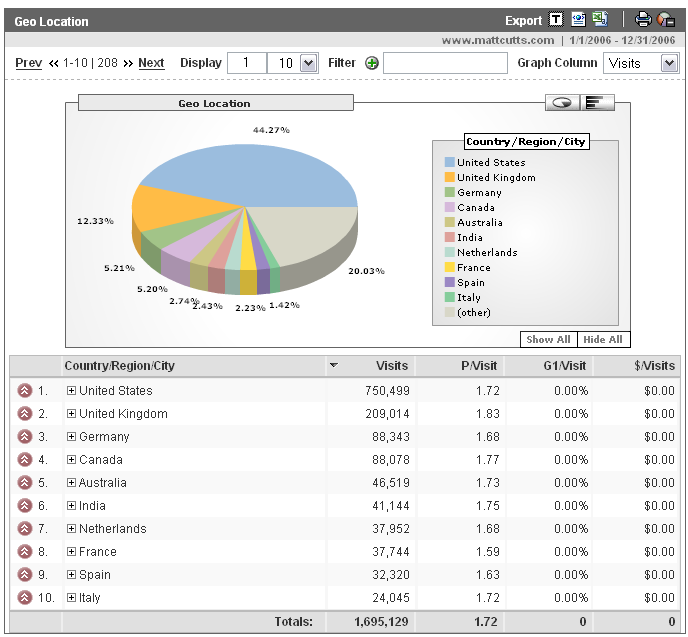 Besides Sitemap is anylystics to me an eye opening tool. Mighty and in cooporation with Adwords it enabled me to develope a strategy to improve Content – and relevant visits!!!!! Even so I`m far away from (see the Map above) Matt`s going into million results. But I could proofe relevant results brought sales to my advertisers! I Now I will offer my service to customers wanting to pulish their service -or sell products in Germany! Some days later: Google analystics since yesterday even better. Also I will miss some function which ro me have been easier to be used! The new version is intotatally new style. I hope analystics can keep some function! I’ve noticed the blog has 10x more visitors than any other section. It is the same way with my website. It looks to be a good sign that you have a group of people who are always looking for new information from you.